Paris' Popular Bike Rentals Spark Electric Car Plans Paris plans to launch the world's largest electric car access scheme in September of next year. The city is hoping to emulate the popularity of its easy rental system for bicycles with a plan that will allow Parisians to rent an electric vehicle whenever they need to. Paris plans to launch the world's largest electric car access scheme in September of next year. 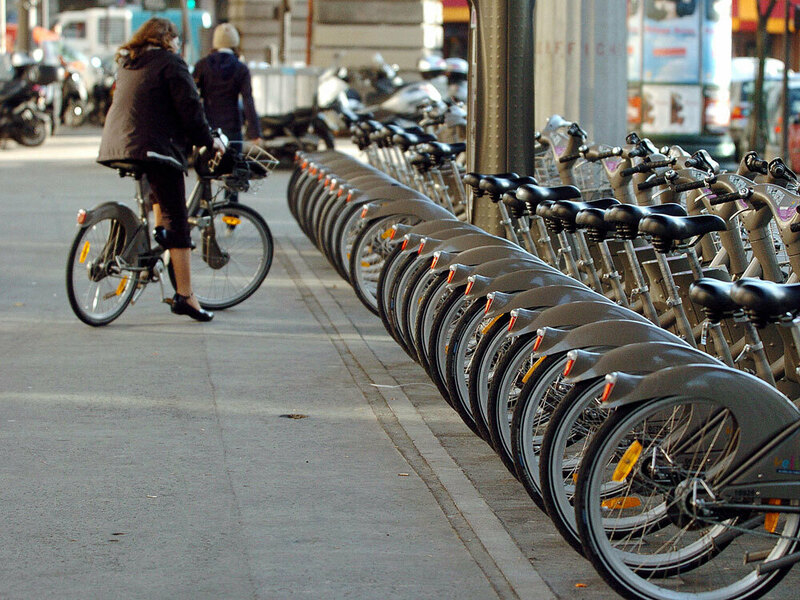 The city is hoping to emulate the popularity of its easy rental system for bicycles, known as Velib. This time around, Autolib, which stands for auto liberte, will allow Parisians to rent an electric vehicle whenever they need to, with the goal of cutting down on car ownership, traffic and pollution. Paris' pedestrians and cyclists have had a lot to celebrate in a decade of pro-green policies. Since 2001, traffic in the city has dropped nearly 25 percent because of better public transport and restrictions on automobiles. In a shady square of a middle-class neighborhood in Paris' 20th arrondissement, a jazz band recently feted the third anniversary of the city's bike rental program. Alongside the musicians, a coterie of city officials proudly inaugurated two new bicycle lanes. 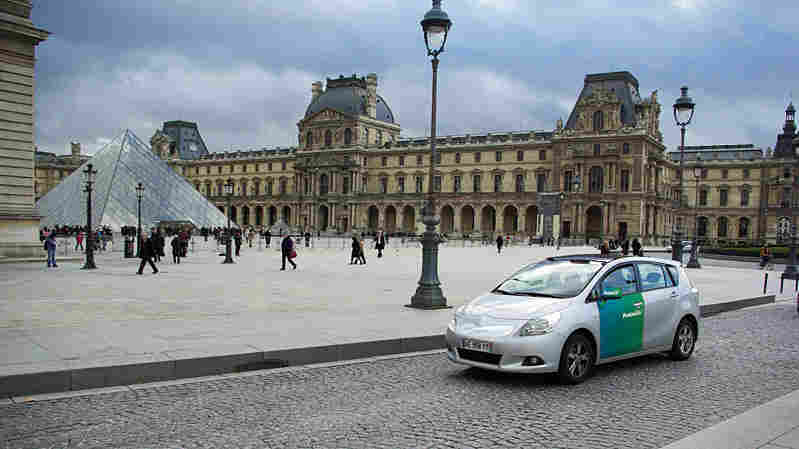 Now, with Autolib, many people may be able to get rid of their cars entirely, says Paris' deputy mayor, Annick Lepetit. "Why not?" she says. "There are many people who absolutely need a car, but with Autolib, they'll have a car. The advantage will be that it will be a lot cheaper and less of a hassle, because they'll be able to pick it up from one place and turn it in anywhere else in the city, without looking for parking." They have to be kept in good shape. And this seems to be a real problem. I just don't think Parisians are civilized enough. Velib is popular because people can go to banks of bicycles in their neighborhood, leave a deposit and register at a computer terminal -- and ride away. The bikes can be left at posts all around the city. The car system will work in a similar way, except the cars will be stored in parking garages as well as on the street. Lepetit says the price will be much less than the estimated $7,000 a year it costs to keep a private car in Paris. So far, four bidders are vying to operate Autolib, which will be a public-private partnership with the city of Paris. "The success of the program is going to depend on a number of different factors," says Bill Moore, publisher of EV World, an online magazine about electric vehicles. Moore says that by offering a fleet of all electric cars, the city of Paris is making a bold move that could provide a model for the rest of the world -- as long as the plan avoids the obvious pitfalls. "I think the last thing anyone wants to see is these vehicles stalled along various Paris motorways or out in the suburbs, and having to be towed into a place to get recharged," he says. A row of Velib rental bicycles sits in a rack in central Paris shortly after the program was introduced in 2007. Officials say there will be about 1,000 battery-recharging stations around the city, with a fleet of 3,000 electric cars planned for the start. Moore says he believes electric car technology is ready for prime time. His bigger worry is that Autolib could suffer the kind of theft and vandalism that plagued Velib. Although the situation has now improved, the sturdy gray bikes had a shaky start. Nearly 8,000 of the original 20,000 bikes in the program were stolen or ended up hung from lampposts or thrown into the river Seine. In the 20th arrondissement, the Levy family has stopped to watch the jazz band. Carol Levy says you do need a car in Paris if you have children. "Autolib is a really good idea. Both the bike and car rental schemes are great ideas," she says. "But they have to be kept in good shape. And this seems to be a real problem. I just don't think Parisians are civilized enough." City officials say the electric vehicles will be much harder to damage or steal than the Velib bikes. But burning cars is practically a national sport in France. Every weekend, hundreds of automobiles are burned by disgruntled youths in cities across the country. Observers say the success of Autolib will depend on whether all sections of society see benefits from the scheme and embrace the electric cars as their own.